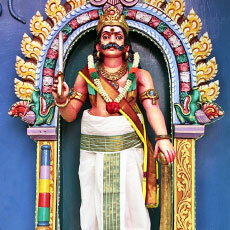 Sri Muneeswar is one of a list of deities known as "kaaval Theivangal". Other such deities include Sri Maduruai Veeran and Sri Ayyanar. These deities are usually found in the boundaries of South Indian Villages from evil. Sri Munneswar has a large following of devotees in Singapore and Malaysia too. Sri Muneeswar has an interesting origin. Lord Shiva was incensed when the King Dhaksha performed the Achvamantha Yagam and did not invite him. The lord's anger exploded and from the Lord came Sri Muneeswar who took seven incarnations – Sivamuni, Thavamuni, Nathamuni, Jadamuni, Daramuni and Vaazhmuni. Muni means single and 'Shakthi' and Eshwar is Lord Shiva.